I feel like I’ve come to know you quite well over the last few years. It was a rocky relationship at first, what with you not paying attention to me and hanging out with your friends too much and all. But ever since you started taking better care of yourself and dressing up a bit before reading me, we’ve become closer than ever. You see, you and I — me and you — are sharing an intimate connection right now through the Internet. We’re two bits in a byte. Open and close braces surrounding an “<3”. Venerable electronic soul mates. My company’s first commercially available product: The Online Business Platform from OpenRain. OpenRain’s managing superwoman may have had a small stroke when I told her she had to produce and post-produce this video, but I think I made her feel better by offering to take all the credit if it turned out well. I’m disappointed that the stunt scenes and Clive Owen guest appearance didn’t come through, but… recession and all that… or at least that’s what I inferred from her half-paralized drooling. So without further ado, please enjoy this awesome video demo of the Online Business Platform that I did all by myself… or not. 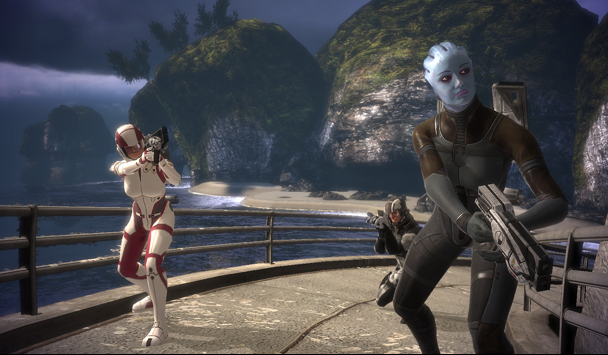 I figured I’d have some “me” time this weekend, so I picked up a copy of the highly praised Mass Effect. Saying it’s good is obvious; awesome is an understatement. Groin-grabbingly enthralling, genre-shattering entertainment is somewhere in the neighborhood. We’re talking a contender for best video game ever here. So if you’re last minute Christmas shopping for a 360 owner (possibly yourself), I can’t recommend Mass Effect highly enough. The gameplay itself is difficult to describe. Take the fun parts of leveling, storyline, voice acting and small squad combat RPG elements from Baldur’s Gate, the pace, feel and vehicle action of a FPS squad combat shooter, and drop that into an incredibly rich sci-fi backdrop of a Star Trek episode. Awesome sauce!